A nonprofit founded by a Silicon Valley entrepreneur has filed a sweeping, high-stakes lawsuit challenging state teacher protection laws. A victory would overturn a tenure, dismissal, and layoff system that critics blame for the hiring and retention of ineffective teachers. A loss in court could produce bad case law, impeding more targeted efforts to achieve some of the same goals. Students Matter is the creation of David Welch, co-founder of Infinera, a manufacturer of optical telecommunications systems in Sunnyvale. The new nonprofit filed its lawsuit in Los Angeles Superior Court on Monday on behalf of eight students who attend four school districts. A spokesperson for the organization told the Los Angeles Times that Los Angeles philanthropist Eli Broad and a few other individuals are underwriting the lawsuit. They have hired two top-gun attorneys to lead the case: Ted Boutrous, a partner in the Los Angeles law firm of Gibson, Dunn & Crutcher, and Ted Olsen, former solicitor general for President George W. Bush. The lawsuit asserts that five “outdated statutes” prevent administrators from making employment decisions in students’ interest. The tenure statute forces districts to decide after teachers are on the job only 18 months whether to grant them permanent job status. Once granted tenure, they gain due-process rights that make it expensive and difficult to fire them even if they’re “grossly ineffective.” And then, when an economic downturn comes – witness the last four years – a Last In/First Out (LIFO) requirement leads to layoffs based strictly on seniority, not competency. The protection of ineffective teachers “creates arbitrary and unjustifiable inequality among students,” especially low-income children in low-performing schools, where less experienced teachers are hired and inept veteran teachers are shunted off, under a familiar “dance of the lemons” since they cant be fired. Because education is a “fundamental interest” under the state Constitution, the five statutes that “dictate this unequal, arbitrary result violate the equal protection provisions of the California Constitution” and should be overturned. The lawsuit doesn’t prescribe a solution. Earlier this year, the Sacramento-based nonprofit EdVoice brought suit against Los Angeles Unified over the pro forma way it conducts teacher evaluations. But here, the suit isn’t seeking to overturn the Stull Act, which defines how evaluations are done; it says that the district (along with nearly every other one) has chosen to ignore the law’s requirement that student performance be included in teacher evaluations. There’s no shortage of critics of the tenure, dismissal, and layoff laws, which teachers unions have lobbied hard to preserve. California is one of few states that have not lengthened the probationary period for teachers. More than two dozen states have strengthened their evaluation systems in the past several years. California’s dismissal law, with its 10-step process laden with due process, can cost districts hundreds of thousands of dollars to fire a teacher on the grounds of unsatisfactory performance, which is why districts often work around it by paying teachers to retire or pushing them from one school to another. The tenure law may be particularly challenging. As the suit points out, something like 98 percent of probationary teachers have gotten tenure. The two-year probationary period (actually 18 months, since teachers must be notified by March of their second year) is not long enough. Too often evaluations have been slapdash. But the law itself doesn’t require a district even to cite a cause in denying tenure; the power of dismissal lies with the employer. Students named in the lawsuit are from Los Angles Unified, Pasadena Unified, Sequoia Union High School District, and Alum Rock Union Elementary District, although only Los Angeles Unified and Alum Rock, which serves 11,000 students in San Jose, are specifically cited as defendants, along with Gov. Brown, Superintendent of Public Instruction Tom Torlakson, the State Board of Education, the state, and the State Department of Education. The only specific reference to Alum Rock was in the identification of plaintiff Daniella Martinez, 10, whom the lawsuit says chose to transfer to a public charter school because “of the substantial risk that she would be assigned to a grossly ineffective teacher who impedes her equal access to the opportunity to receive a meaningful education.” The initial filing doesn’t cite evidence of specific teachers who negatively affected Daniella or the other seven defendants. It refers to studies by such groups as the National Council On Teacher Quality, which issued a blunt assessment of the tenure and dismissal practices of Los Angeles Unified, and on research by Hoover Institution author Eric Hanushek, who concludes that just by dismissing 6 to 10 percent of weakest teachers, students’ academic achievement and long-term earnings as adults would increase significantly. Los Angeles, as the state’s largest district, may have been named as a defendant because its superintendent, John Deasy, has been outspoken about the need to change labor laws. 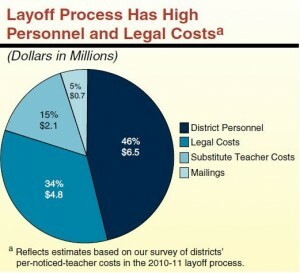 United Teachers Los Angeles has also sued over a comprehensive teacher evaluation system that Deasy has put in place. Deasy would appear to be a friendly witness for the plaintiffs. In a statement, he said he supports lengthening the probationary period, quickening the dismissal process, and reforming the state’s layoff law. “To my dismay, we have lost thousands of our best and hardest-working classroom instructors through the last hired, first fired rule. 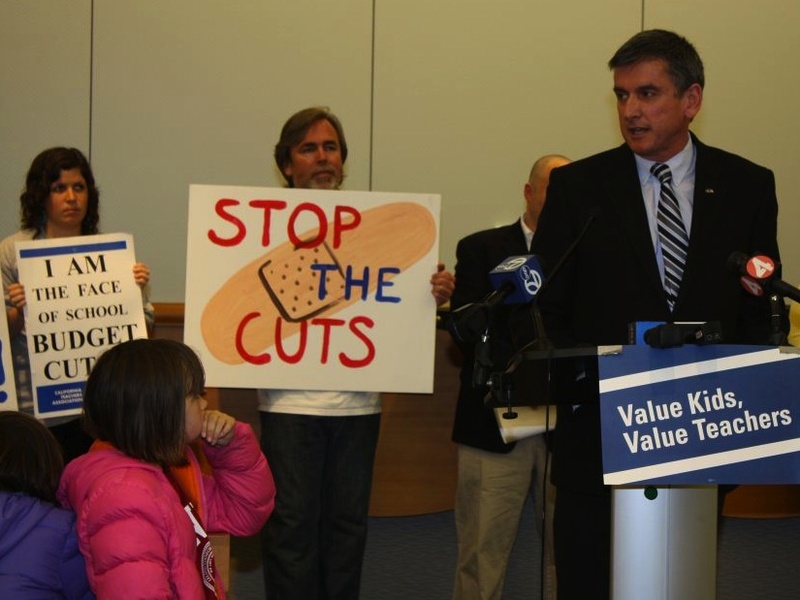 When forced to reduce our teaching staff through budget cuts, we are compelled through state law and union rules to base these difficult decisions primarily on seniority,” Deasy said. But when questioned, Deasy will be pressed to acknowledge that it may not be the laws but the implementation that counts. Since joining the district, first as deputy superintendent, then superintendent, Deasy has pushed administrators to apply more scrutiny in granting tenure and more perseverance in dismissing bad teachers. Last year the district terminated 853 teachers. Furthermore, the number of probationary teachers denied tenure rose significantly last year: from 89 in 2009-10 (10 percent of those eligible) to 120 teachers in their first year and 30 in their second year. Other superintendents would agree that well-trained, persistent principals can document the case for teacher dismissals, notwithstanding cumbersome, excessively burdensome requirements. Amid concerted opposition from the California Teachers Association, the Senate Education Committee on Wednesday delayed acting on two bills that would make it easier and quicker to dismiss teachers for misconduct. Both SB 1530 and SB 1059, along with an identical bill, AB 2028, introduced in the Assembly, are in response to criminal charges of sexual abuse against students by three former teachers at Miramonte Elementary in Los Angeles Unified. In two of the cases, the district failed to document and follow up on earlier investigations of suspected illegal acts. SB 1530, sponsored by Sen. Alex Padilla, a Democrat from Los Angeles, would give school boards the final say over firing teachers facing sexual, drug, and other serious misconduct charges. A current three-person appeals board would be replaced by an administrative judge who’d be issuing only advisory opinions. The bill also would give districts the option of suspending a teacher suspected of serious misconduct without pay, and would eliminate the 45-day notice to teachers facing disciplinary action. 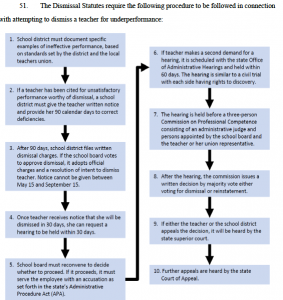 The provisions closely parallel recommendations of the Los Angeles Unified School Board. SB 1059, by Republican Senate Leader Bob Huff of Diamond Bar, would also quicken the firing process and would go further to also give school boards the final say over firing for unsatisfactory performance as well as misconduct. It, like Padilla’s bill, would remove a 4-year statute of limitations on keeping misconduct investigations in a teacher’s file. California school districts should not be bound by seniority when budget cuts force them to lay off teachers, according to far-reaching report released yesterday by the state Legislative Analyst’s Office. 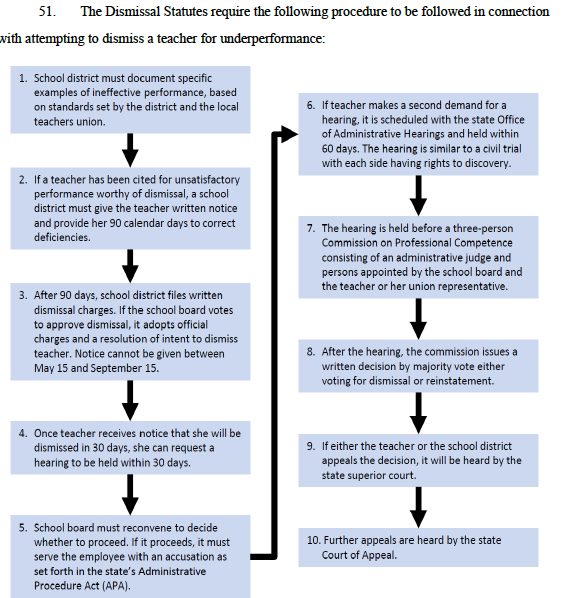 A Review of the Teacher Layoff Process in California also recommends changing the deadline for notifying teachers they may be laid off from March 15 to June 1, eliminating the teachers’ right to a formal hearing and giving more authority to local districts and bargaining units to determine the layoff process. The LAO based its recommendations on responses to a survey from 230 out of about 950 school districts, although the Analyst’s Office said those responses included eight of the state’s ten largest districts. 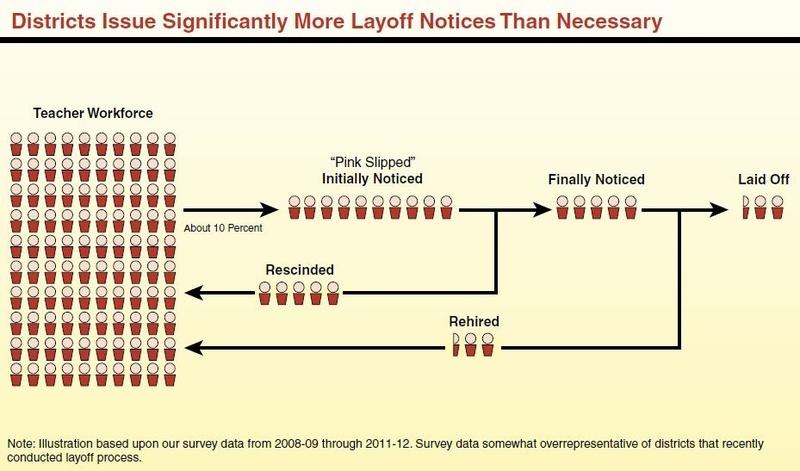 Nearly three-quarters of layoff notices are rescinded. (Source: CA Legislative Analyst). Click to enlarge. One the main concerns was the huge number of “overnotifications,” or sending pink slips to far more teachers than necessary. According to the LAO, for every ten teachers given preliminary layoff notices last March, about 75 percent of them ended up keeping their jobs. The problem lies in the timeline, which forces school districts to make budgetary decisions before the governor releases the May Revise, which contains the most current information on projected state revenues. To be on the safe side, districts issue layoff notices based on the worst-case scenario. Union leaders criticized that logic as overly simplistic. Shannon Brown, California’s 2011 Teacher of the Year and president of the San Juan Teachers Association, said moving the deadline for layoff notices may make sense from a fiscal perspective, but would have devastating consequences for laid-off teachers, giving them just a few weeks to find a new job. That’s what contributes to low teacher morale, said Brown. That and the entire crisis in education funding in California that’s led to increasing class sizes, dwindling resources, teacher bashing, and the loss of some 32,000 teaching positions in the last four years. “The layoff notices only add insult to injury,” she said. Each pink-slipped teacher costs the district about $700. (Source: CA Legislative Analyst) Click to enlarge. administrative and legal expenses, plus the costs of postage and paying for substitutes for teachers who challenged their notices before an administrative law judge. Typically teachers will ask for a hearing if they believe the district made a mistake in their hiring date or the type of credential they hold; both factors that count when determining who gets laid off. But the LAO concluded that the hearings do not “add substantial value” to the process, and recommended that they be eliminated and replaced with a less formal review process. Asked about the report at the Capitol yesterday morning, State Senate President pro Tem Darrell Steinberg said although he hadn’t had a chance to review it detail, he sympathized with the financial dilemma facing school districts and noted that unless the Governor’s ballot initiative to raise taxes passes in November, the fiscal crisis will become even more severe. At that point, some of the LAO’s recommendations will have to be on the table. “We need to consider an array of options moving forward,” said Steinberg. Cynthia Dalmacio has a mnemonic device to keep track of how long she’s been teaching in Brisbane Elementary School District; one pink slip for each of her four years. The latest one came yesterday, the state deadline for notifying teachers that they may not have a job in the next school year. 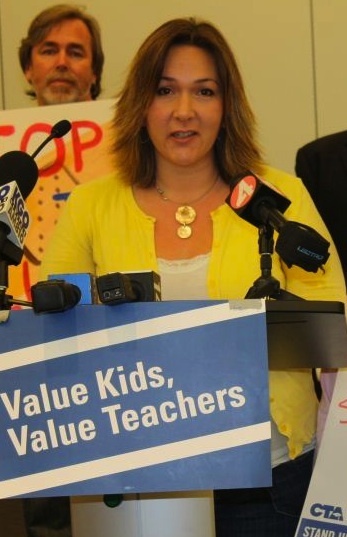 Brisbane teacher Cynthia Dalmacio received her fourth layoff notice in as many years. (photo by Mike Myslinski). Click to enlarge. The small hillside city of just over 4,000 residents, overlooking San Francisco Bay, has three schools with 550 students and 30 teachers. The district sent out eight layoff notices this week. Previous cuts left one principal for the two elementary schools, and one superintendent for Brisbane and neighboring Bayshore Elementary School District. “I spend the last few months of each school year in a deep depression because teaching isn’t just a job for me, it’s who I am,” Dalmacio told reporters and a handful of teachers and parents at a news conference organized by the California Teachers Association (CTA). As of Thursday afternoon, the CTA had heard from more than 200 local unions – including the largest districts in the state – and reported that about 20,000 California teachers were facing the same uncertain future as Dalmacio. Not counted in these numbers are first- and second-year teachers who, because they’re not tenured, can be laid off without notice. That number could reach into the thousands, but it’s hard to know, because the state doesn’t keep track of it. 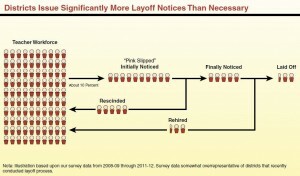 This year, however, the trend is shifting and pink slips are reaching teachers way up the seniority ladder. One Brisbane teacher who received a pink slip has been there for eight years. San Juan Unified in Sacramento sent notices to some teachers with eleven years in the district. Seniority is also being sidestepped in some cases, as more districts turn to provisions of the State Education Code to prevent high turnover rates at academically fragile schools. It started on a large scale in Los Angeles Unified School District two years ago. A lawsuit, filed on behalf of students at three low-performing schools serving mostly students of color, argued that they were being denied an equal education as a result of instability caused by massive layoffs. Since the settlement in Los Angeles Unified, several other large urban districts have used the exemptions in the Ed Code to protect some schools from disproportionate layoffs, including Long Beach, San Francisco – where the union is fighting the move – and Sacramento City Unified. Last year, an administrative law judge allowed the district to protect jobs at nine schools under the Ed Code exemption for teachers who have undergone special training to improve academic achievement and use different teaching methodologies. CTA Vice President Eric Heins releasing layoff numbers at news conference in Brisbane. (Photo by Mike Myslinski) Click to enlarge. CTA Vice President Eric Heins finds the argument unconvincing and suspects it’s a political move by districts to ease out veteran teachers who are active in the union and keep younger teachers who are less involved. “If we have schools that are so bad that nobody wants to teach there, then it’s not right to put a new teacher there or any students,” said Heins. For the most part, districts have been able to rescind many of the preliminary layoff notices as the state budget picture became more clear. Last year, the Governor’s May budget revise suggested (erroneously as it turned out) that revenues would be high enough to prevent further cuts. But districts still had money left from the Obama Administration’s American Recovery and Reinvestment Act (ARRA) which kept thousands of teachers in the classroom. This time there’s no federal safety net, and school funding is riding on passage of a tax initiative in November. “This year may be a little bit different just because of the sheer size of the cuts combined with structural issues inside school districts,” said Arun Ramanathan, Executive Director of The Education Trust—West. Then he chided the governor and legislators for abdicating their responsibility by focusing solely on the November election. Sacramento City Superintendent Jonathan Raymond was even more blunt in his criticism. “We have to be honest that education is not a priority in California; if it was how come we let things get like this?” he wondered, citing cuts in everything from smaller class sizes and libraries, to music, art and athletics. The biggest challenge facing legislators as they pursue rewriting the state’s teacher evaluation law this year is not how to weed out the worst teachers but how to retain the best. The key to the latter won’t be found in rubrics and value-added test scores but in deeper training for novice teachers and more career options for veteran teachers. 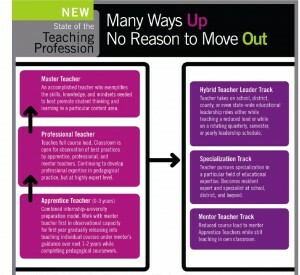 A baker’s dozen young and mid-career teachers make an articulate case for the latter in a new report, “Many Ways Up, No Reason To Move Out,” the product of the Bay Area New Millennium Initiative, a project affiliated with the North Carolina-based Center for Teaching Quality (go here to download it). The report serves as a reminder to lawmakers to keep in mind “To what end?” as they consider what elements should comprise a teacher evaluation. The teachers call for three-year apprenticeships for new teachers and a career ladder that offers accomplished teachers leadership opportunities to entice them to stay in the classroom – instead of quitting the profession, as more than half do by the fifth year of teaching in some districts, or pursuing a job as an administrator, in part to make more money. “Basically it’s like this: If you’re competent and ambitious, you have to leave your job. Right now the only way to move up is in administration,” Sherene Judeh, one of the co-authors of the report, said at a conference last month in Sacramento on Teaching Quality and California’s Future (go here for a summary of the conference by David B. Cohen, one of the organizaers). Judeh, a fifth-year teacher, and co-presenter Anna Martin, a seventh-year middle school teacher, embody the challenges facing teachers and districts that don’t want to lose them. A ninth- and tenth-grade humanities teacher and grade-level leader at Lighthouse Community Charter High School in Oakland, Judeh has had multiple roles already, chairing the algebra readiness committee and working with novice teachers as a mentor. Martin is a hybrid teacher in the Alum Rock Union School District in San Jose, coaching teachers, making student placement and master scheduling decisions, mentoring students, and providing professional development for all staff members. But most districts lack clearly delineated career paths to become master, mentor, hybrid, or specialization teachers, linked to objective standards and professional development fostering teachers’ aspirations. And they lack pay differentials recognizing those levels of achievement, so that a master teacher can one day earn as much as an administrator. Judeh and Martin started through Teach for America, which makes their advocacy for a three-year apprenticeship all the more interesting. They had only a five-week summer training course before being placed in high-poverty urban schools, then got their teaching credential while teaching school the first year. In the first year of a three-year preparation program, the apprentice teacher would observe a mentor teacher, while helping to plan lessons, working with students in small groups and taking courses for a credential. In the second year, the apprentice teacher would teach two classes, with the mentor teacher observing and the apprentice meeting regularly with the cohort of apprentice teachers in the credentialing program. In the third year, the apprentice would teach a full load, with the mentor teacher observing during several paid release days per month. The apprenticeship is modeled after urban teacher residency programs in Boston and Chicago. San Francisco Unified and Aspire Public Schools have year-long versions, too, as do a number of teacher preparation programs at several California State University campuses. The teacher candidates bear the full cost of the program. Carolyn Nelson, dean of the College of Education and Allied Studies at California State University, East Bay, said “a more gradual training model, like a medical residency, would be a wonderful way to go.” The issue would be funding, particularly paying for the equivalent of a full-time teaching salary the second year, with added support the third. The expectation would be that better trained beginner teachers would feel more supported and confident and be less inclined to leave. Turnover has a big cost: Referring to a study by the Alliance for Excellent Education, the report cited the cost of recruiting, hiring, and retraining replacement teachers nationally at $7.34 billion annually, with high-poverty, high-minority districts bearing a disproportionate cost. The recommendations are what may be needed to attract a new generation of teachers looking for more respect and more career opportunities backed by better pay. In a new labor agreement that embraces local school autonomy, Los Angeles Unified School District Superintendent John Deasy has jumped from one school reform horse to another. He dismounted the Public School Choice horse, thus ending the era when the school district sought to improve schools through robust competition among district-run school management teams, charters, and other complex operating arrangements. Under what has been called “portfolio” logic, the school district would assemble the best collection of schools it could, putting underperforming ones up for competitive bids while encouraging the ones that were doing well. Deasy and United Teachers Los Angeles President Warren Fletcher saddled up a new filly — the daughter of school reforms past — called decentralization. The underlying logic is that diversity in approach to schooling is good, that many different models of instruction are needed, and that teachers and administrators know best how to design schooling and to self-regulate their jobs. They were right to get off the old horse. It was dead or at least hobbled. The 2009 Public School Choice resolution offered by former board member Yolie Flores was an audacious idea, but political pushback tied its legs from the beginning. Its racing life was short. In the first round of applications, the school board rejected Superintendent Ray Cortines’ recommendations and awarded none of the newly constructed schools to charters. The persistently underperforming schools, which had been ordered to write competitive proposals, largely competed against themselves. Few charter or external organizations sought to run them. Conventional wisdom in the charter world is that taking over existing public schools is too fraught with pain and difficulty to be worth the effort; better to start anew. However, the new decentralization horse does not have a good track record. LAUSD rode this horse hard during the 1990s, and both Deasy and Fletcher could learn from that trial. The 1990s decentralization horse didn’t get fed enough. Schools that joined the LEARN project were promised budgetary flexibility, which largely never appeared, and added funding, which dried up after a few years. There may be no food at all for the new decentralization mount. While the labor agreement promises formative assistance for struggling schools and help for planning newly decentralized ones, the state budget shortfall, with more in store next week, may truly empty the feedbag. The 1990s decentralization horse often didn’t know where the finish line was. LEARN training focused more on adult process skills than hard-core analytics about student achievement. There was no agreement about how to measure the outcomes the schools wanted, and for most of the period California lacked statewide measurements. The same ambiguity applies now. Will the decentralized schools be judged only by the state’s Academic Performance Index? Will teachers be evaluated by how much they contributed to test score increases? Teachers in general and UTLA in particular loathe so-called “value added” measurements, but they have not proposed an alternative. The expectations for decentralized schools, the means of evaluating them, and the consequences are all up for grabs. Without a finish line, the new school reform horse is as likely to spend its time chewing the infield grass as galloping on the track. The 1990s school reform horse had inconsistent trainers. Teachers and principals attended sometimes extensive workshops and residencies. (Palm Springs in July. Bring gloves; your steering wheel will be too hot to touch.) They learned the process rudiments of what was called a professional learning community. But these schools were isolated within the larger LAUSD and UTLA organizations. The idea of teacher leadership was rejected by the administrative establishment as improper and by union activists as not being tough minded enough. The 1990s school reform horse had a short season at the track. LEARN was approved by the school board in 1993 and got under way the following year. By 1999, the race was over. External supporters grew frustrated with LAUSD, and they moved on to foster charter school development, particularly those now called the Alliance Schools. Opposition in the district, school board, and union increased. Victory was declared, but the season ended. Fletcher and Deasy may have saddled up a better horse. Using the union contract as a reform document gives reform a stable home. Contracts last longer than superintendencies or a union president’s term, and they are good at patterning behavior. Still, neither union nor district could resist the temptation to mire their new ideas on a slow muddy track of committee approvals, school votes, plan documents, and more approvals. It may never get to the starting gate. I don’t know whether this horse will run, but I’m putting down my bet. See you at the $2 window. Charles Taylor Kerchner is Research Professor in the School of Educational Studies at Claremont Graduate University, and a specialist in educational organizations, educational policy, and teachers unions. In 2008, he and his colleagues completed a four-year study of education reform of the Los Angeles Unified School District. The results of that research can be found in The Transformation of Great American School Districts and in Learning from L.A.: Institutional Change in American Public Education, published by Harvard Education Press.